This weekend the US National Cyclocross Championships are taking place in Colorado. With the snow lining the course continuing to melt, it looks as though the course will remain muddy and slick. The safest bet for racers is going to be a mud tyre to cut into the rutted corners and grab hold of the tricky off-camber sections. In the endless chatter this past year about hydraulic disc brake systems for cyclocross, tyres have oft been overlooked. And just as cyclocross brake development had seemed to be stagnant until the very recent past, so too have tyre tread designs evolved rapidly as of late. Arguably the archetypal cyclocross tread is the Grifo. For several decades, the Grifo has carried champions to the filthiest victories in cycling. First made by the original Clément Pneumatici, the tread has remained visually unchanged since around the 1960s. In 1990 parent company Pirelli moved tyre production to Thailand before eventually leaving the cycling market entirely in 1998. The manufacturing assets were acquired by another Italian company but not the brand Clement. That company is now known as Challenge but the Grifo is almost unchanged in name and appearance. The Grifo’s mélange of narrow & broad arrowheads, long knobs, and circular knobs has truly stood the test of time, all the more impressive considering that tread was originally created for 24-27mm casings. Over the years others have had similar designs (Wolber Cross), if not virtual clones (Dugast Typhoon). Vittoria’s all-circular knob Tigre was a noted departure, but that was eventually replace by the XG which is again a virtual Grifo clone. Czech brand Barum also had a circular knob design. Eventually the company came to be known as Tufo, and their design evolved into something like a Grifo with more squared knobs, no circular ones at all. In contrast, mountainbike treads have evolved continually since the 1980s. A cynic might say that rapid growth in the mtb demographic pushed tyre companies to continually revamp designs in order to market their brand competitively, but certainly some of it had to be driven by frenzied technical innovations in mtb frame and suspension design. Early mtb treads often looked like scaled down motorcross treads, perhaps the ultimate being the Panaracer Spike. There were front and rear specific designs such as the front/rear WTB Velociraptor and the Panaracer Dart/Smoke combo. These had lengthwise knobs up front for cornering grip and lateral paddles in back for traction. The Specialized Ground Control, featuring square blocks and aggressive, reinforced side knobs was a trend setter. The low profile tread patterns with modest side knobs, like the Ritchey Speedmax, became popular as less technical courses became the typical arena for XC racing. 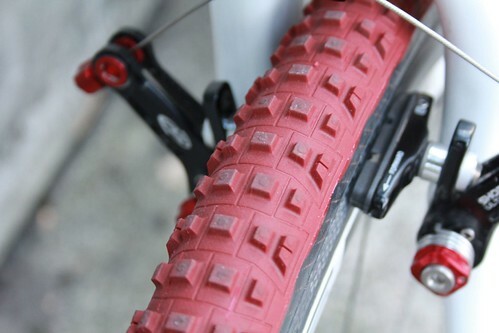 Nowadays, cross country mtb tyre tread can roughly be generalized as patterns of square, triangular, or asymmetric chevron blocks in a spectrum from low-profile for hardpack to moderate height for general conditions. Prominent lateral paddles are less popular than before, and even modern mud tyres come nowhere close to the Panaracer Spike’s 8mm knobs of terror. In the ‘00s, some of that XC tread philosophy found its way to CX rubber, particularly in clincher tyres marketed by companies that had not before had a strong presence in that scene. Cyclocross was the fastest growing segment of the market, so naturally companies were eager to enter that market. The original Michelin Mud fully lived up to its appellation with widely-spaced, small asymmetric chevrons. The Mud 2, more of an all-around tyre, has the chevrons sliced into pairs of squarish knobs that are slightly lower and closer spaced than before. The newer Specialized cyclocross tyre is similar (though in my opinion it does not perform nearly as well). Hutchinson treads such as the Toro and its predecessor the Bulldog have distinct, square knobs with concave tops. The Tufo Cubus has simple rows of squares, the ones on the shoulder being siped. Eventually the traditional makers like Challenge and Dugast would respond with their own innovations. Recent trend in CX treads consists of lopsided wishbones like on the Challenge Limus and the PDX (from the reborn Clement brand) and acutely angled chevrons like on the Dugast Rhino and Small Bird. Nowadays there is far greater diversity in cyclocross tyres than even a decade ago, but despite it all the Grifo (and the Typhoon, its clone by Dugast) are still heavily favoured in medium conditions. Cyclocross legend-in-his-own-time Sven Nys credited a recent victory to using his technical skills to allow him to run Grifo tyres while his main rivals resorted to slower mud treads. Why is this? Well, it is said that tyre pressure and casing construction have more effect than tread design. Dugast and Challenge are traditionally made tubular tyres with supple casings and can easily be ridden with PSI pressure in the low to mid-20s, which plausibly explains why pros love them more than stiffer tyres like Tufo and the new Clement. Also, the newer trends in tread seem to make more of a difference in muddy conditions. Perhaps for moderate conditions, the depth and overall density of knobs is more important than the shape of the knobs themselves. If so, then maybe the Girfo just hits a sweet spot from which it is difficult to add or subtract textural features without biasing the result for either firmer or softer conditions. Then consider that cyclocross tyres are still relatively skinny. Unlike XC mountain bike tyres, cyclocross rubber must be 33mm or narrower for UCI racing. Compared to the typical 2.1-2.3” width of a XC model, there is just not as much tread to work with. The UCI scaled the maximum size down from 35mm to 33mm in the same set of rule revisions that formally authorized disc brakes. The rule was said to be a way of controlling equipment cost and logistics, as it was assumed that riders would feel compelled to have quivers of wheels containing both multiple treads and widths. That being said, the biggest reason to choose narrow tyres is sticky mud, largely because skinnier tyres make for less mud build up within the clearances of the frame. Forty years ago cyclocross tyres were typically 27mm or less, yet no one seems motivated to go anything close to that kind of skinny anymore. Drawing parallels to cross country mtb, XC racers have moved to slightly wider tyres since the early days even though the bikes have gone from full rigid to 100mm or more of front and rear suspension. And a 29er wheel is 11% larger in diameter than a 26” wheel. Arguably those changes would allow riders to run narrower, lighter tyres, but again the only time they choose truly narrow is for mud. Meanwhile, everyone knows that cyclocross’ transition to disc brakes has been an economical and painless process. Just ask SRAM. In the end, tread design is just one factor in cyclocross tyre performance. Rubber compounds, the suppleness of the tyre casing , and particularly air pressure may all be more important. Cyclocross’ elite still heavily favour traditionally made tubulars, but it is possible that tubeless tyre performance may someday supersede. On the other hand, changes in cyclocross frame design will be driven by brake and drivetrain innovations rather than tyres. While cyclocross geometry is optimized for the somewhat restrictive 33mm maximum tyre width and minimal frame weight, a new market category of “gravel grinder” bikes has evolved for distance riding and racing on unpaved roads and non-technical trails. This has very quickly led to a flood of 700C tyres in 35-45mm range in a variety of tread designs, far outside UCI regulations. If not for the UCI tyre width rule, one wonders what direction cyclocross tyre design may have gone. In this piece I limited the discussion to medium condition and mud tyres; I should like to talk about cyclocross file treads and how they compare to the current crop of “gravel grinder” tyres. But that’ll have to wait till another time. As the cyclocross season reaches its climax, the courses are slick and muddy. There will be plenty of time to talk about file treads and gravel grinding later in 2014, as Bike Hugger will be exploring some dirt road riding later in the year.